Taj Mahal | You hear that?!? Frankie and Johnnie (sometimes called Frankie and Albert) is a good ol’ fashioned traditional song about killing your sweetheart for cheating on you. All the greats have covered it. Johnny Cash, Sam Cooke, Elvis … Lindsay Lohan. But it was Jack Johnson’s version that led me to Taj Mahal. Jack mentioned he styled his version after Taj Mahal’s, and it was the first I’d heard of the legendary, influential blues musician. That’s the amazing thing about covers – they form an endless chain, leading from one band to the next, cluing you into who influences who and who to check out next. 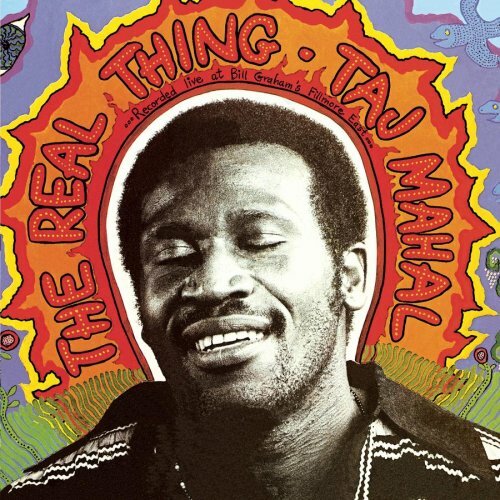 My father-in-law recently clued me into The Real Thing, a high energy live album Taj Mahal recorded with a sizable backing band in 1971. It’s some of the most uplifting blues you’ll ever hear, with ENOUGH TUBA TO KILL A HIPPO!